I bought these cool octagonal wooden coasters at HomeGoods the other day. They are SO cool. I bought the whole pack of 8 for $8.00. So, for a dollar a piece I felt it was worth it! I recently gave my son’s room a reboot for the Fall. I had so many cool elements going into the space with lots of wood and a mix of metals. With the new wood top that I put onto his nightstand I was afraid that he, or his friends, might ruin it with a drink that would sit beside his bed all night so I thought these would be helpful to stave away any damage. These coasters were cool by themselves and they didn’t come monogrammed. I wanted to add a few personalized touches to the room. I had added frames full of pictures on DIY picture ledges that he loves, a monogrammed pillow and a few other things to personalize the space. I thought these would be really cool monogrammed and add function as well. Choose a font and size the letter to the proper dimensions.Copy as many times as needed and print them out. 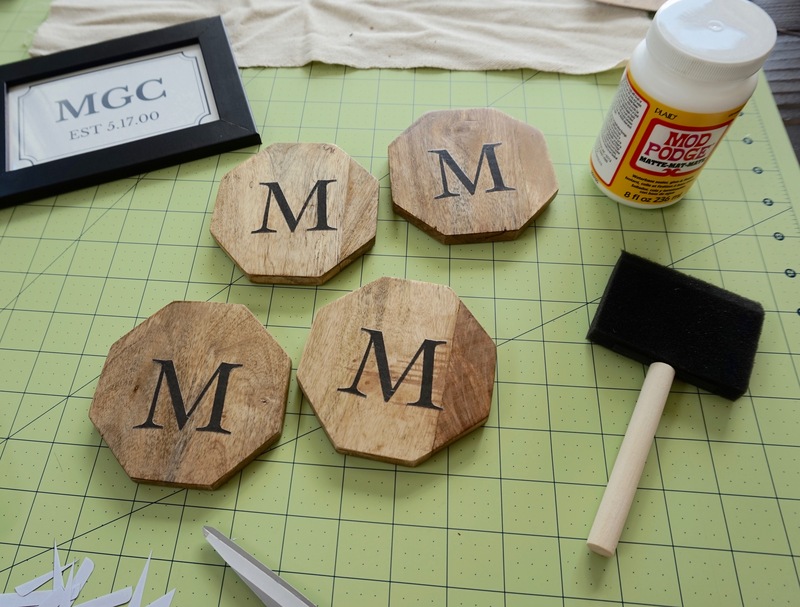 Grab the decoupage, add thin layer to the coaster and glue letters to coasters. Cover entire coaster, even the letter, with decoupage. Add another coat over the entire coaster when dry. Add a coat of polyurethane to the top to protect the letters from peeling when moisture hits. You can brush it on or spray it on. This project was really fast and easy and I enjoyed using my craft room again. It took no time at all to get a personalized look. I could have painted them but opted for the decoupage method because I wanted them DONE. I love the way they turned out and so does he! Now he has four coasters to use with his friends….let’s just hope they ACTUALLY use them! Previous Post How to Decorate a Room Successfully and Find your Style!